Sam Houston State University South Residence Hall, now known as Piney Woods Hall, is a new residential complex located on the university’s campus. The building is designed to be a place that offers a strong sense of community, where students feel connected to the University, and to act as a gateway to the campus and draw students together. Camarata Masonry Systems, Ltd. (CMS) performed the masonry work on this building in two parts. The first part was the interior CMU load-bearing shear wall towers that house the elevator shafts and staircases and the second part is the exterior masonry veneer. 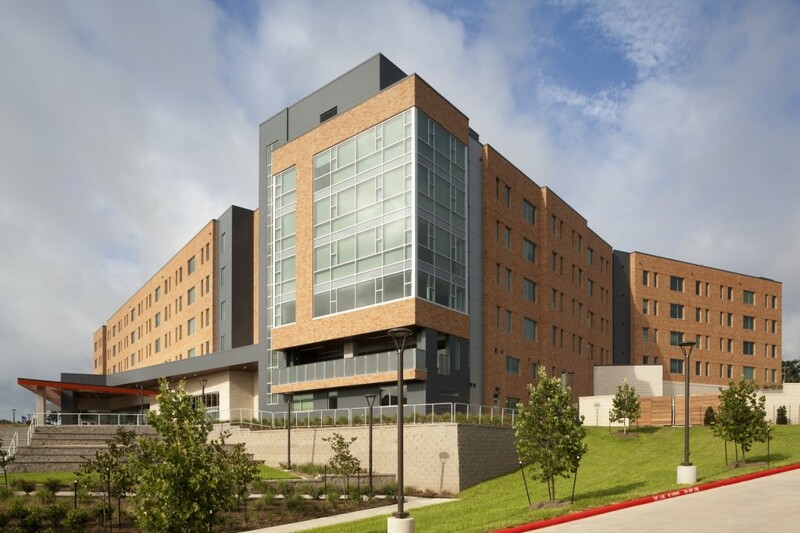 The materials supplied and installed on this project consisted of the following: 24,720 each 8x16x8 lightweight CMU; 12,050 each 12x24x4 burnished CMU; and 188,070 each Acme econo king velour Sam Houston blend brick. The building is made up of five separate sections and is situated on a severely sloped site. Each section independently conforms to the change in grade and each is connected one to the next, end-to-end, at various levels, in an irregular polygonal configuration. There is a large gap between the first and fifth sections that provides an opening into a sloped central courtyard that is located within the polygonal layout. In addition to brick and CMU, metal panels, wood panels, and glass are incorporated in the facade of the building. These elements are interspersed throughout the façade, making coordination and accurate layout paramount. •	Each section of the building includes its own interior CMU shear wall tower. •	The configuration of every level of each tower varies from top to bottom, with different rebar requirements at each level. In order to ensure that the bar was placed properly and the slab tie ins were correctly located, CMS prepared coordination shop drawings for the shear walls. •	The grade of the site slopes differently around the entire perimeter of all sections of the building, requiring that each face of the building have its own unique scaffold solution. Also, the grade made it difficult to construct the scaffold and complicated material distribution around the site. •	The multiple materials on the façade required extensive coordination to ensure proper continuity. The masonry veneer contains many recessed and protruding bands that align with other elements of the façade, most notably the many varying sized windows. Precise layout was critical in locating these elements. •	The oblique angles in the brick façade required that jigs be set up for onsite cutting. The project is exceptionally well executed with crisp lines and a very clean appearance. It was completed on schedule with over 44,000 man hours and having no accidents.